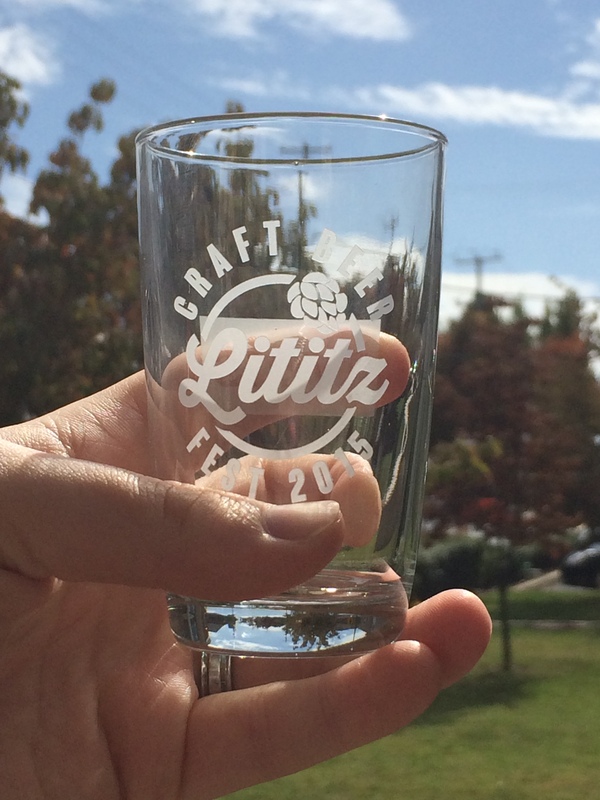 The 2nd annual Lititz Craft Beer Fest has come and gone like a stein of beer in a German beer garden. 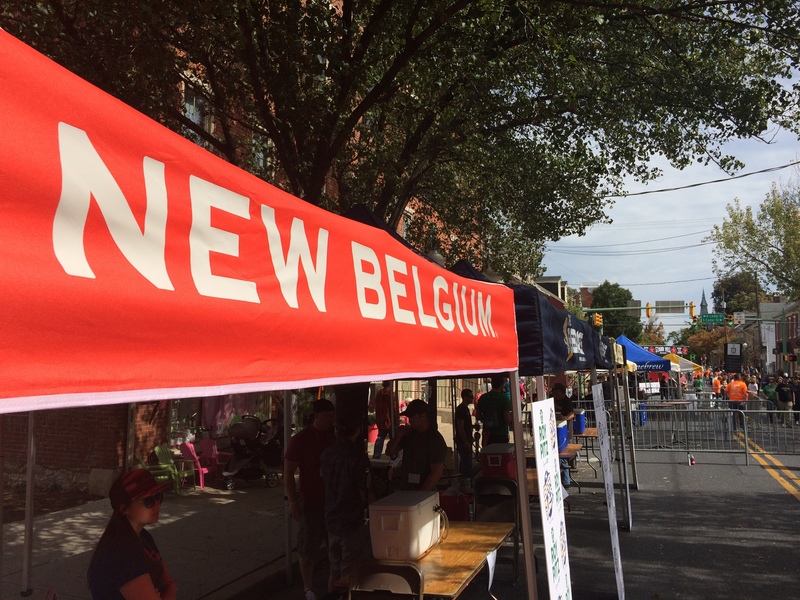 The recently named #1 town in Pennsylvania to “Get Away from It All” saw several thousand beer enthusiasts flood its streets, clamoring for the mix of local and national brewers pouring their best for the three hour event. With an overcast sky and mild temperature, the weather gave it’s blessing, providing the perfect conditions to enjoy an IPA’s refreshingly crisp bitterness, the acidic bite of a sour, the earthy yam, spices and malt backbone of a pumpkin beer and the roasty, sweet caramel and molasses warmth of the porters and stouts. It was a day for all styles and one that surely delighted the thirsty crowds, who gobbled up tickets in record time. Much of the positive outpouring of community support is directly related to the efforts of the volunteers and the organizers, who proved themselves last year with a hugely successful effort. 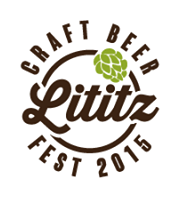 It’s a testament to that success that the 2015 Lititz Beer Fest sold out on July 19th, only 18 days after going on sale and 2 months ahead of the event. Assuming there is a 3rd annual beer fest, do NOT hesitate to get tickets the first chance you get because blink and they’ll be gone. Purchasing a ticket will also get you the added karmic benefit of contributing to charity. The event organizers, the Lititz AMBUCS, donate the money raised to help the mobility and independence of disabled individuals in our community. Beer appreciation for a cause. What’s not to love about that? 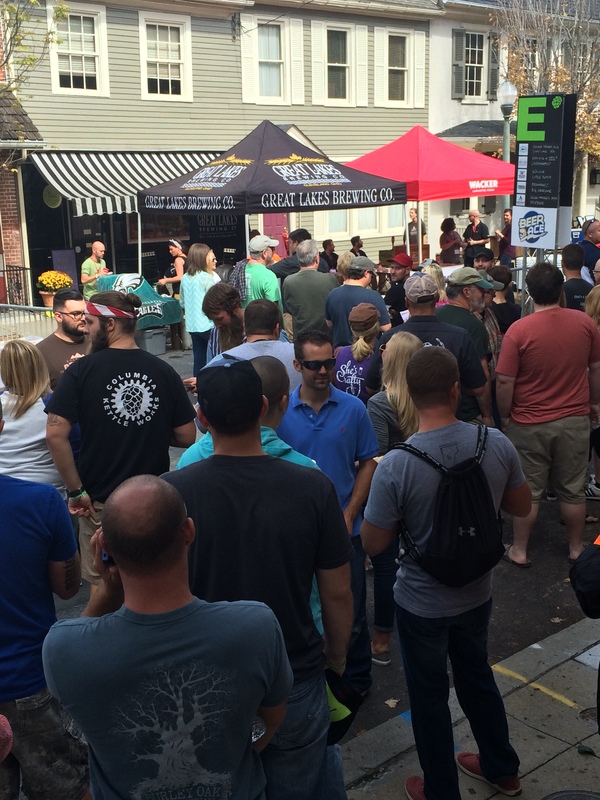 The festival kicked off with a 2pm air horn blast, allowing the already cued masses to start sampling. 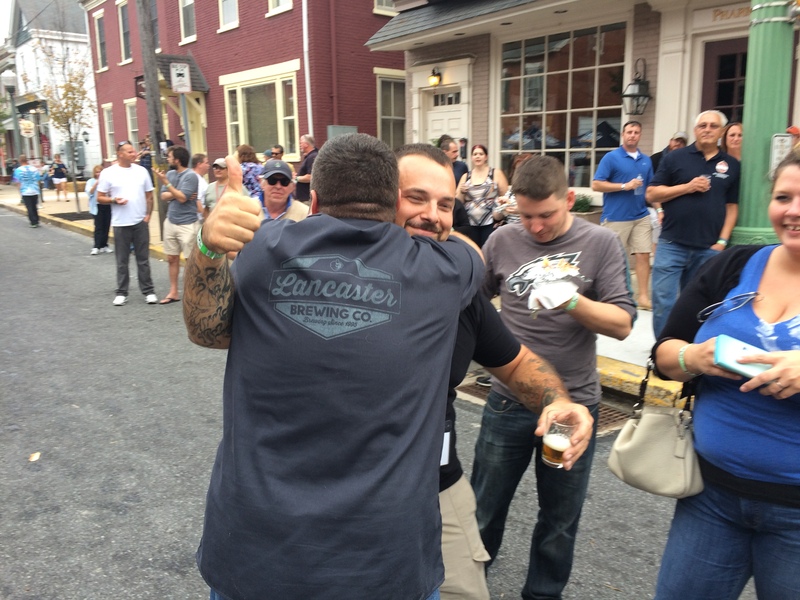 As expected, there was a nice presence from industry giants like Founders Brewing Company, Stone Brewing Company, their 19th Anniversary Thunderstruck IPA was a favorite of the festival, and Downingtown’s own Victory Brewing Company. But beer fests are rarely defined by these bigger brewers. 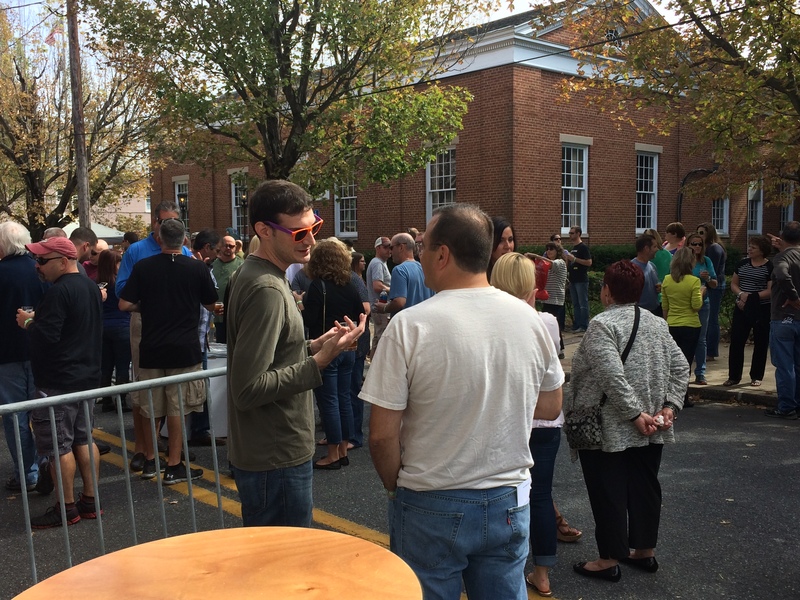 As anyone knows who regularly attends these mass beer sampling, if you go to one regional beer fest, you’ve practically gone to all of them. Same brewers, serving the same beers. While it’s great to have the big craft players bring their usual A-game to our town, what you really look for are the up-and-comers that shine with unexpected beers. 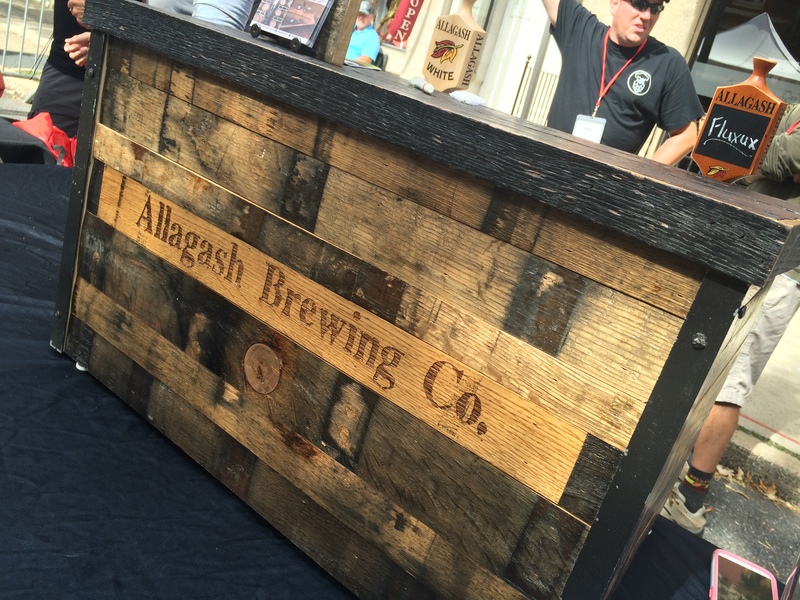 The organizers of the Lititz beer fest kept this in mind, bringing in brewers like Carton Brewing Company out of New Jersey, Jack’s Abbey Brewing, a lager only brewer out of Massachusetts, and Allagash Brewing Company out of Maine, fresh off a gold medal win at the Great American Beer Fest for their White Ale, also being served at the fest. While there were plenty of great beers on offer, I think that there are several worth highlighting. 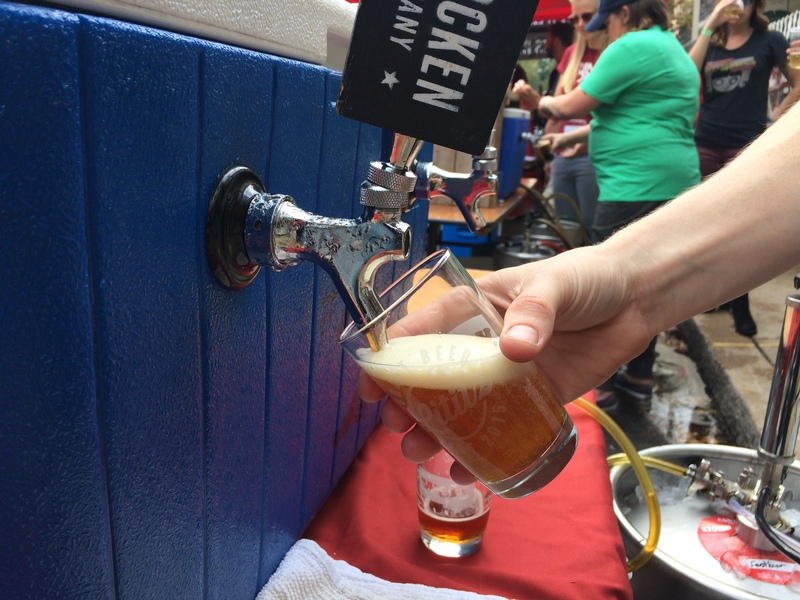 A brewery like Wacker Brewing Company with roots tracing back to the mid-1800’s Lancaster featured one of many Kölsch beers for the day, but separated itself with flavors of bread and tart lemon meringue that was light on the tongue while still having body. Dry and perfectly carbonated, it is a great example of the style. Another brewer that impressed was Cape May, offering up two IPAs. Costal Evacuation IPA was a dank West Coast style DIPA with a huge tropical aroma like a freshly opened packet of hop pellets. Big notes of mango and citrus balanced a buttery caramel malt that emphasized the sweeter side. The second, Take Five, was a confident session IPA that hit notes of grass, toasty grain, lemon citrus and mild skunk for the festivals second best session IPA next to Carton’s delicious Boat beer. I’d be remiss if I didn’t also mention Tattered Flag Brewery and Still Works that ran their Tattered Flag IPA through a Randall, a double-chambered filter developed by Dogfish Head that infuses beer as it pours. Tattered Flag used fresh cones of Citra hops to make for a refreshingly citrus-spiked, tea-flavored IPA that drank well for the weather. According to the staff I spoke with, there were some definite favorites that had many beer drinkers coming back for more. Hardywood Park Craft Brewery’s Sidamo Coffee Stout proved popular as did the unique offerings from Turkey Hill Brewing, which included a sour cherry Kölsch and Brett Farm House Kölsch. ZeroDay Brewing out of Harrisburg also saw plenty of repeat business for their Mango Habanero Pale Ale, a beer that balanced pepper heat with the delicate body of a pale and didn’t take on the vegetal green pepper flavors that can overrun the style. I realized that I originally had this beer several years ago at a homebrew competition held at Appalachian Brewery in Harrisburg, so it was nice to see the brewer hit the next level. 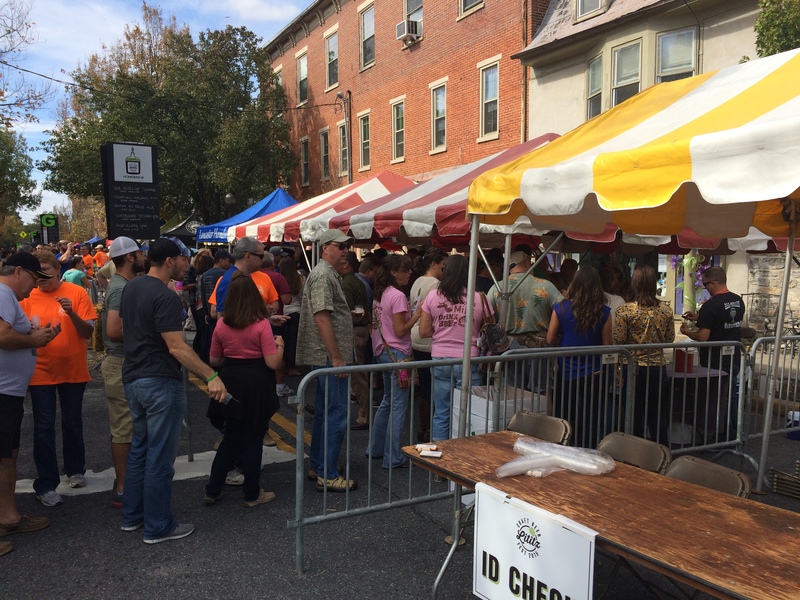 It’s possible we’ve already sampled the next ZeroDay thanks to the hugely popular Lititz Beer Fest Homebrew Competition. 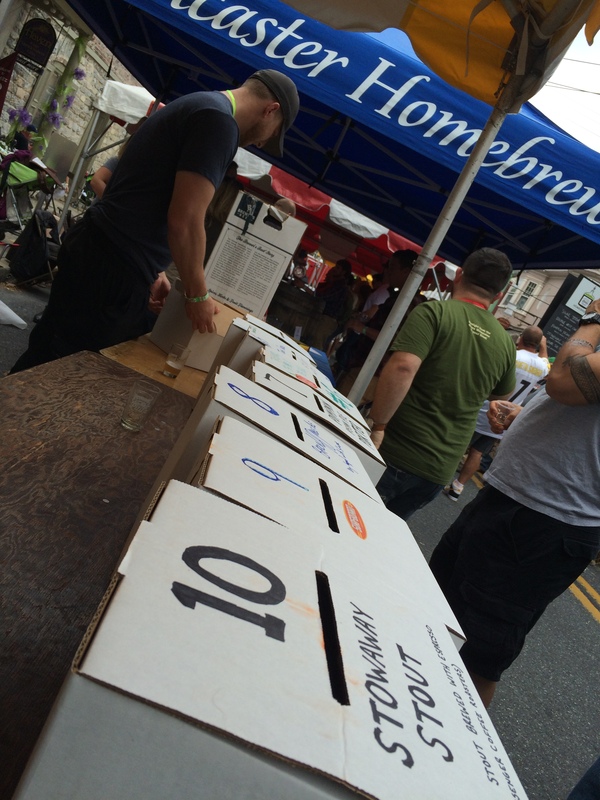 The tent was mobbed throughout the day with samplers voting for their favorite from 10 different homebrews. These 10 were narrowed down by a committee from roughly 70 entries. My personal pick was a Pumpkin Pecan Pie Porter, an earthy porter that was my favorite dark beer of the fest, but the ultimate winner was a graham cracker and vanilla pumpkin beer called The Gourd, Bad, and the Ugly. As longs as there are brewers naming beers, puns will be alive and well. Second place went to an equally impressive imperial espresso stout called Stowaway Stout, with the IPA, Solar Temptations, coming in third. 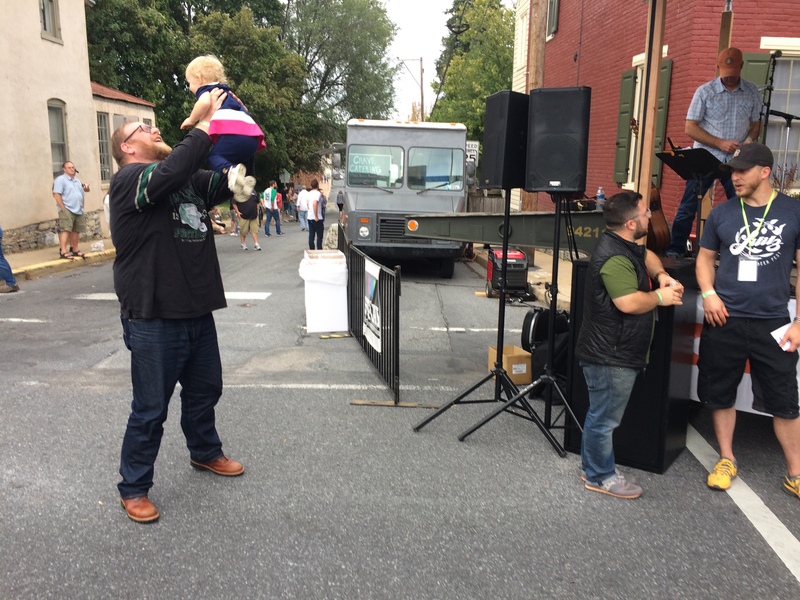 Another aspect of the Lititz Beer Fest that should be commended are the risk takers that weren’t content to just bring their most popular beers and call it a day. 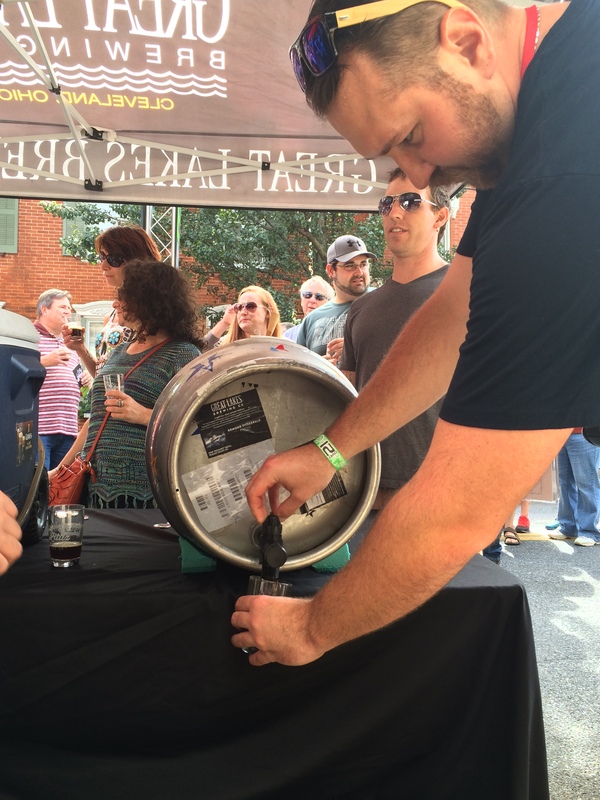 Ephrata’s St. Boniface Brewing brought a firkin of their ESB, Wynfrid, brewed with coffee beans that was reminiscent of Carton’s Regular Coffee cream ale, and Ohio’s Great Lakes Brewing Company brought a Lititz Beer Fest exclusive. 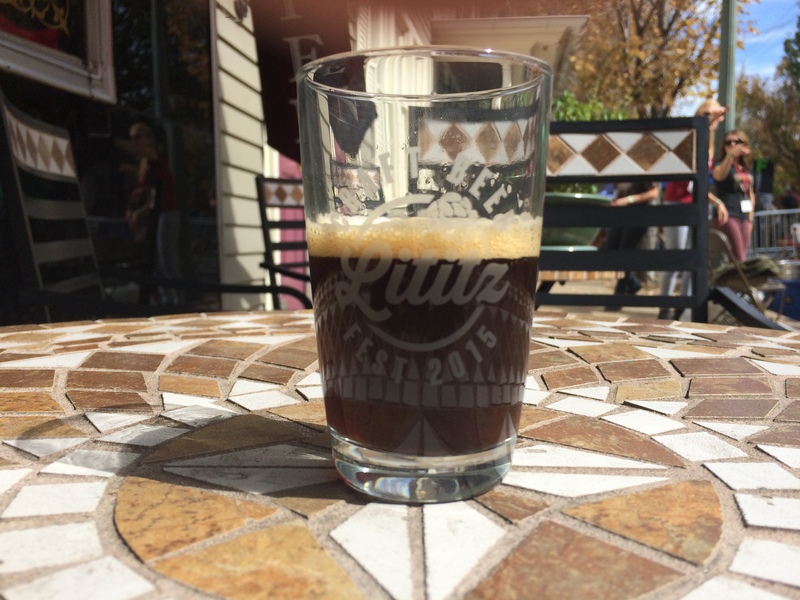 Local sources of Lititz pride, Wilbur Chocolate and Whiff Roasters, contributed their products to create a one of a kind brew with Great Lakes Brewery. I can tell you it was at the top of my and many other’s lists and the first beer I had for the day. By using chocolate and coffee in a batch of Great Lake’s signature porter, Edmund Fitzgerald, they created a subtle take on an already great beer. Peat and roasted malts balanced with a wisp of chocolate and a dose of coffee bean without the oily acid that can spoil a morning. This version was a solid beer that might have needed a little more time in the secondary to really make the adjuncts truly sing. Regardless, I tip my hat to Great Lakes for this unique brew even if I wanted just a little more of the collaborators to come through. 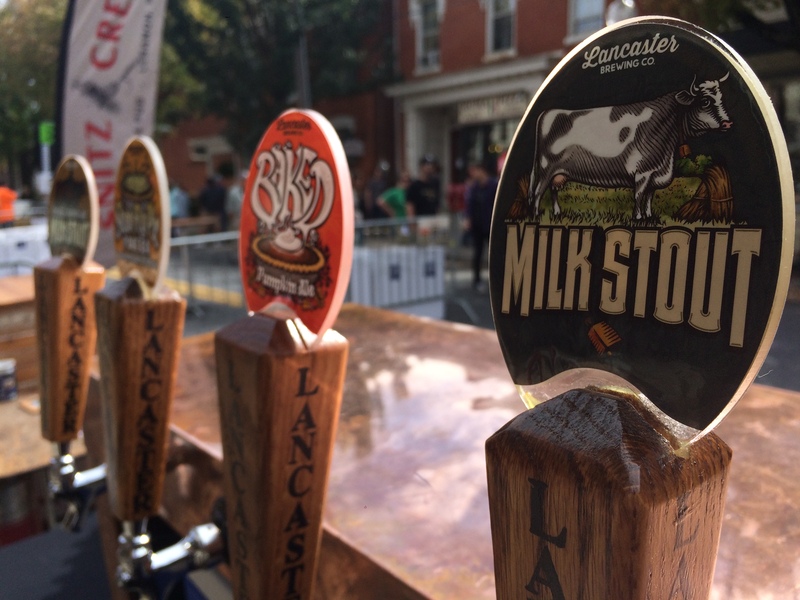 The unique aspects of the Lititz Beer Fest aren’t limited to just the brews. Unlike many outdoor events, there are no barriers restricting the festival. The only thing separating townsfolk out walking their dogs from the ticketholders is a wristband and a sampling glass. 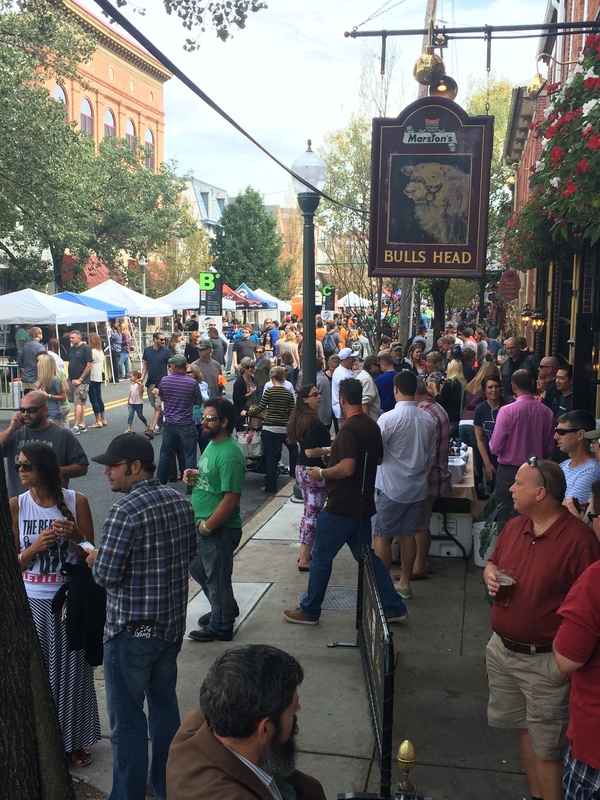 This gives the fest goers the opportunity to sample both the beer and the charming Lititz shops, but at the cost of swelling the event far beyond the already plentiful population of 2,000 festival attendees. Getting around wasn’t terrible, but three hours is tight for 57 brewers and 120+ beers, not counting the homebrew competition. Not that anyone recommends sampling 120 beers in an afternoon, but to try all of them would mean an average of 40 an hour or one sample every 90 seconds. Starting an hour earlier would do wonders to loosen up the ticking clock and really give people time to savor and enjoy everything on offer. This issue is partially alleviated by the decision to post the complete tap list ahead of the brew fest. It allows the obsessive, I prefer the term studious, to determine exactly what beers to try and where to find them. I have no problem going back to the same delicious beer well over and over for favorites like Sixpoint’s Resin or Founders’ Breakfast Stout, but too much to try and not enough time to try them meant I had to make the tough decisions. Overall, the festival went smoothly with few hiccups. Port-a-pots were plentiful, beers flowed freely, and only Dock Street was unable to escape the force of nature that was the Pope, missing out on this year’s fest. 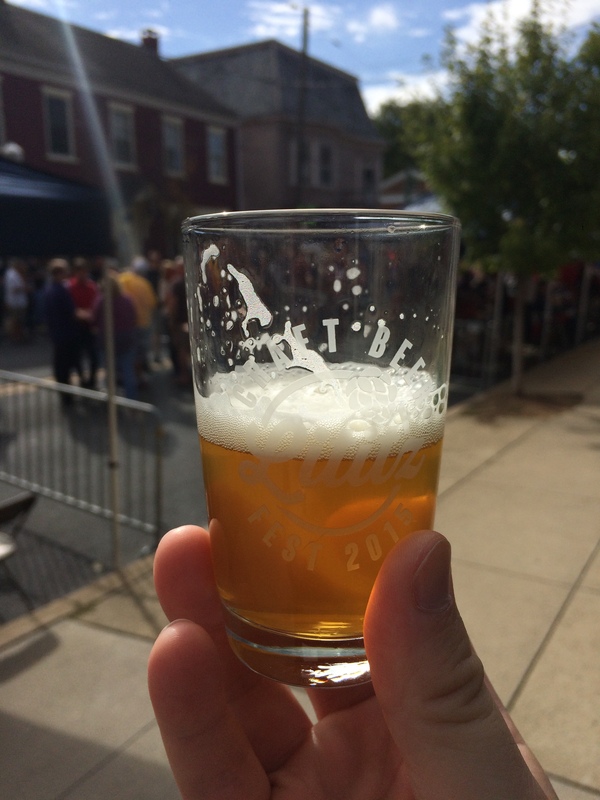 I’m already looking forward to next year, and if this year’s ticket sales are any indication, you’d better start refreshing the Lititz Beer Fest’s ticket page now lest you miss out on what’s becoming one of Pennsylvania’s best celebrations of beer.